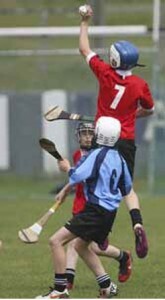 The gaelic ethos in our education system is probably best expressed through our language and our games. In Saint Saviours we attempt to immerse children in both aspects of our deep and rich culture. The games for people who have newly arrived in our parish from abroad is a great way for them to share in this cultural experience. Between gaelic football and hurling and handball we have many boys and girls playing our national sports. It’s an essential part of school life, many children come to school with their hurleys and play gaelic football at break times. Many play handball at break times also. The parish of Ballybeg is home to Saint Saviours GAA club. The club has been brilliant in sup- porting and nurturing our games! We have a great relationship with them, Ollie Ryan, Martin English, the Corcorans and Noel Reidy have given an awful lot to the games in our school. Along with some brilliant and enthusiastic teachers such as Mr Gough, Mrs O’Donaghue , Mrs O’Brien and Mrs Shalloe and of course our care taker Donie Reagan. We have a great team to make sure boys and girls of all ages and backgrounds can enjoy the games. We put great emphasis on fair play and enjoyment rather than winning and this shows in the good behaviour of our teams. 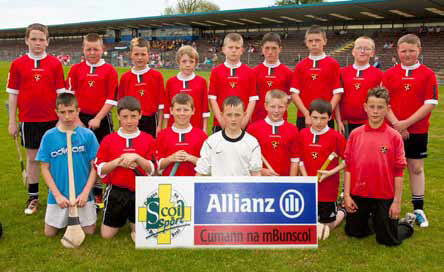 We have also unearthed great talent in the likes of Brandon Mylett and Tadgh Myler, both represented the school on the Waterford primary games team and are names for the future. We were unlucky to lose the final of the U-13 boys hurling but getting there was a success in itself. We will continue to pursue a policy of opening up the games to all children helping them to develop a love of their Gaelic heritage in a fun manner.